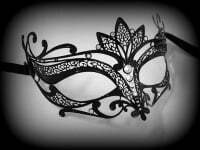 This Vanessa Venetian Filigree masquerade mask is made from painted nero black laser cut metal. For the woman who wants only the best. 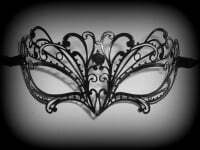 Go for all-out-glamour with this ultra-chic Simply Masquerade Venessa Filigree Masquerade Mask. Designed to make a bold statement, everything about this mask is totally fashion-forward, featuring gloss black laser cut metal and finished with Sworovski Crystals for embellishment. 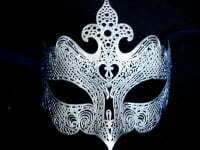 This filigree mask is the ultimate in luxury, be the envy of every fashion lover with the must-have designer accessory of the season. Made in Italy for you. Black ties finish off the look with style and comfort.